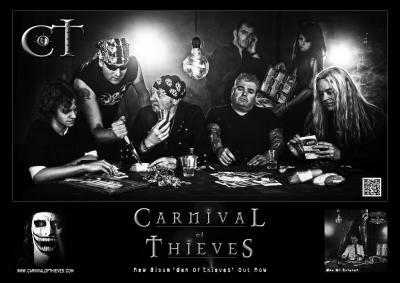 Carnival Of Thieves were formed by Andi Stevenson in December 1990 after parting company with his last band Gasoline Party. Carnival Of Thieves are a Hard Rock band influenced by many sub genres of Rock. The original line up was Orb Mirfin (Vocals), Rob Bellis (Lead Guitar), John Roberts (Bass), Paddy F. D. Bazooka (Guitar), Nick Fuller (Drums) & Andi Stevenson (Keys). The line-up changed a few times over the years but between the band forming in December 1990 to when they split up in March 1998 when Andi became disillusioned with the music business they managed over a 1000 gigs and 2 studio albums. A lot of water has passed under the bridge since then and in 2008 Andi started working on rearranging, remixing and re-recording a lot of Carnival Of Thieves material including a lot of stuff that never got to see the light of day first time around. In 2011 COT’s original drummer Nick Fuller contacted Andi about trying to get the original line up back together. In June 2013 this became reality when the band played a comeback gig at Rotherham Trades Club with five 6ths of the original line up and 4 of them loved it so much they decided to get back together permanently. For the comeback gig COT were helped out by Sam Lewis on Lead Guitar who was playing in local band Whiskey Spirit. “Song For Someone” taken from Den Of Thieves. The video was filmed and directed by the bands Bass Player John Roberts. An album launch party followed to a sell out crowd in the bands home town of Rotherham, England and things were looking good. But then disaster struck when Lead Guitarist Sam Lewis injured his wrists in an accident and on medical advice was told to take 6 months off from playing the guitar. In September 2014 the band released their 2nd video (minus Sam) for a song called “Acid Rain” again taken from their latest album and again filmed and directed by bassist John Roberts. For the last part of the year the band have been off the road due to Sams injury but have been working hard on their new album called “Scallywags” which will hopefully be released around June/July 2015. The early part of 2015 will be used to finish off the new album and rehearse for their live comeback in late early April. A new video will also be released around the same time but no details are available at this time. For the rest of the year the will be out on the road promoting the new album & video playing to venues around the UK and possibly Europe too. The current line up of COT is: Orb Mirfin (Vocals), Sam Lewis (Lead Guitar), Drax (Guitars), John Roberts (Bass), Nick Fuller (Drums) & Andi Stevenson (Keyboards).